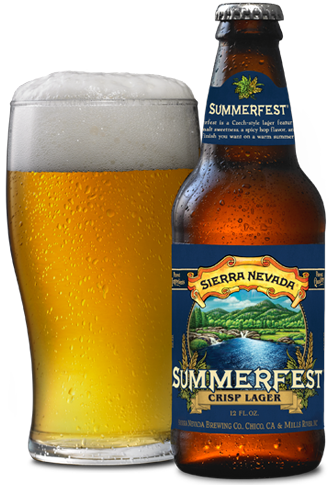 Summerfest® | Sierra Nevada Brewing Co. Since their invention in the 1840s, Pilsener-style beers have become the world’s most popular style. With a nod toward the original Czech tradition, Summerfest is brewed to feature the best of Bohemian nature. Crisp, golden, dry and incredibly drinkable, Summerfest has a delicate and complex malt flavor and spicy and floral hop character—the perfect warm weather beer. All beer is broken down into two camps: ale or lager. The principal difference is the variety of yeast. Ales use a yeast called Saccharomyces cerevisiae, referred to as “top fermenting” because of the frothy foam created during fermentation. Lagers use a yeast called Saccharomyces pastorianus, called “bottom fermenting” because of the slower, restrained fermentation process. 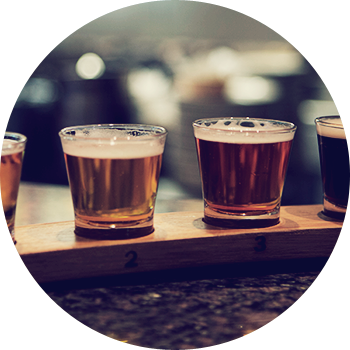 Ales are fermented at warmer temperatures and generally produce more fruity and spicy aromas from the yeast. Lagers are fermented at cooler temperatures and produce cleaner, more reserved aromas, which let the malt and hops shine through. To those who would not go quietly…the dreamers, the builders, the iconoclasts. Before prohibition, America had more than 1,750 working breweries. By 1980, there were fewer than 100. The beer itself became boring, bland and banal—eager to offend less rather than to please more. In the west, there was a revolution afoot, a few solitary restless rebels working for a change. They knew there was more to beer than what they were given and they went their own way. They focused on flavor, character, style and craft. With names like Maytag, McAuliffe, Grant, Grossman and DeBakker, they built tiny breweries and collectively changed the tastes of millions. They were pioneers, innovators, firebrands, but most of all they were inspirations. Today there are more than 2,000 breweries in the US, with more opening every day. America now makes the greatest number of beers in the most styles anywhere in the world. Worldwide, Americans have something of an outsized reputation. Bold, brash and brazen. To some, that boldness is perceived as arrogance, but for us it’s just daring spirit and a thirst for adventure. The term “American” in brewing is not necessarily a sign of origin, but rather a brewing ethos and homage to that daring nature we love so much. In the early days of the craft brewing movement, there were far fewer beer styles and what was on record largely comprised the historical ales of the UK and the lagers of Germany. As American brewers began experimenting with homegrown ingredients and their own techniques, they inadvertently created beer so unique it defied conventional categories. Instead of a traditional pale ale, there all of a sudden was American pale ale—a new, rowdy hybrid of the older beer, intense with hop flavor and aroma. American-style beer is shorthand for the kind of brewing we do at Sierra Nevada—a reference to the use of a clean, crisp and neutral yeast and a healthy dose of hops quite appropriate for the adventurer in us all.